Indeed, we are very much looking forward to providing a great variety of veggies from our garden, but we’re not set up for winter growing at the moment. Will we ever be? Perhaps. Can you imagine having fresh vegetables (that don’t come from California) year-round? That is truly mind-blowing. In the meanwhile, all the bunnies are growing like weeds (see what I did there? ), with plans to double our fluffle in the next few months. That, of course, will lead to exponential growth. Lots of bunnies. Because they breed like, well, rabbits. Eggs. We get a lot of questions regarding egg availability. This part is going to be a little tricky for the moment. Yes, we have fabulous hens. They are beautiful and sweet, and more spoiled than a “farm animal” should ever be. However, almost all of them are silkies. 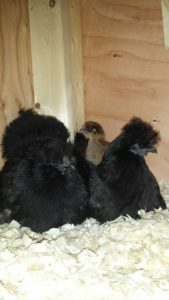 Now, there is not a darn thing wrong with silkie hens. They’re cute and fluffy and mild-mannered, and they make great moms. However, they aren’t exactly known for their egg production; either size or volume. While their eggs are smaller than “normal”, they are still quite delicious. To the left you can see a couple of silkies taking care of one of the chicks from this past spring (that chick has grown up to be a MASSIVE hen who lays extra-extra large eggs). There are actually seven chicks in this photo, all being kept warm by the moms. They have all grown up to be fantastic hens (and one rooster, oops… sorry, neighbors. ), and we will be keeping the flock at our house to provide our “private stash” of eggs. However, as we expand to more acreage, there will be a much larger flock of chickens, and yes, we will have eggs available. But, just as we have to be, you must be patient. There is a series of steps that must be undertaken before we can all enjoy the fruits (eggs) of our labor. To help this process, in addition to more “official” crowd-sourced projects that we have planned, we have set up a convenient PayPal button so people can donate directly to the farm. Sorry, no, you won’t get a Farm t-shirt or coffee mug, but what you will get is our gratitude.